Some of you are whipping right along on your Canning Season blocks, so you may indeed be ready for these border instructions by now! By the way . . . borders are optional. You may decide that you don’t want borders on your quilt. 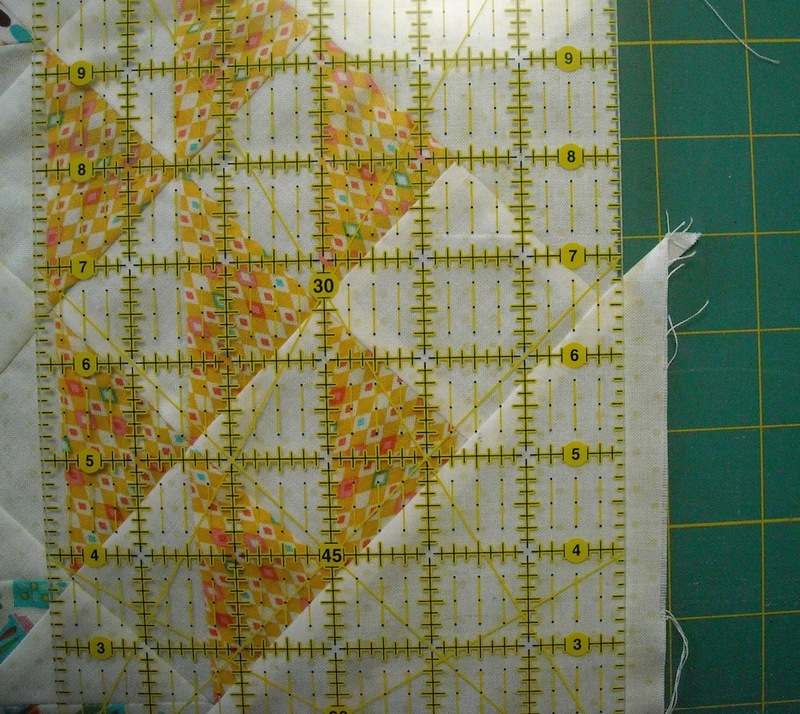 Either way, this first step needs to be completed before you add your borders or otherwise finish your quilt top. Since the setting and corner triangles we used were cut oversized to make the piecing a little easier, you probably now have a bit of an uneven edge on your quilt top. This needs to be trimmed so that the quilt is ready for the borders. We’ll be trimming the edges of the quilt 1/4″ outside of the intersections where the triangles meet, so lay your quilt top on your cutting surface and position your ruler along the edge as shown. The 1/4″ mark is at the point of the block, and the straight edge of the ruler is along the outer edge of the triangle. Line up with the point of the next block in the row with the 1/4″ mark on the ruler. You’ll have to do this in little sections all along the sides of the quilt. 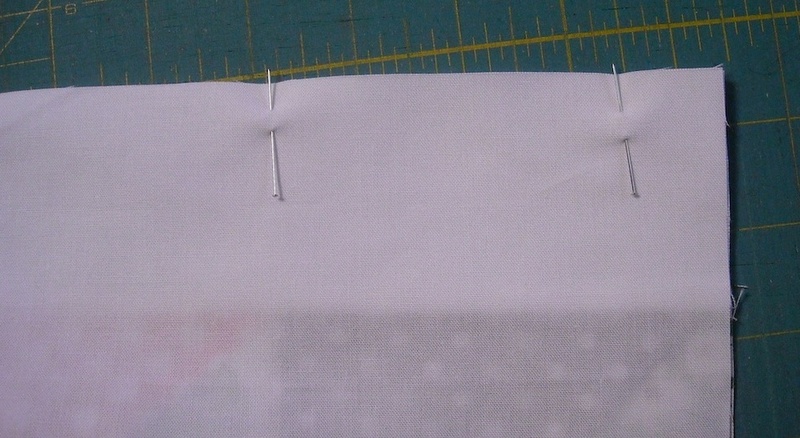 Trim carefully to straighten the edges of your quilt. Do all four sides. When you come to a corner, use the edge you’ve already straightened, and line up that 1/4″ mark against the block, and trim the corner square. After you’ve done the first corner, you can use the trimmed edge of that corner as an additional line to line up with to make the corner nice and square as you start trimming the next side. If you decide to add borders, here’s how . . .
First, I measured my quilt from top to bottom right down the middle (not along an edge). Make sure when you do this, not to stretch or pull your quilt top. Mine measured 86 1/2″. Sew two of the border strips together, end to end, pressing the seam to one side. Then measure it. If it’s long enough to cut your border strip from, then cut the length you need from this longer strip. 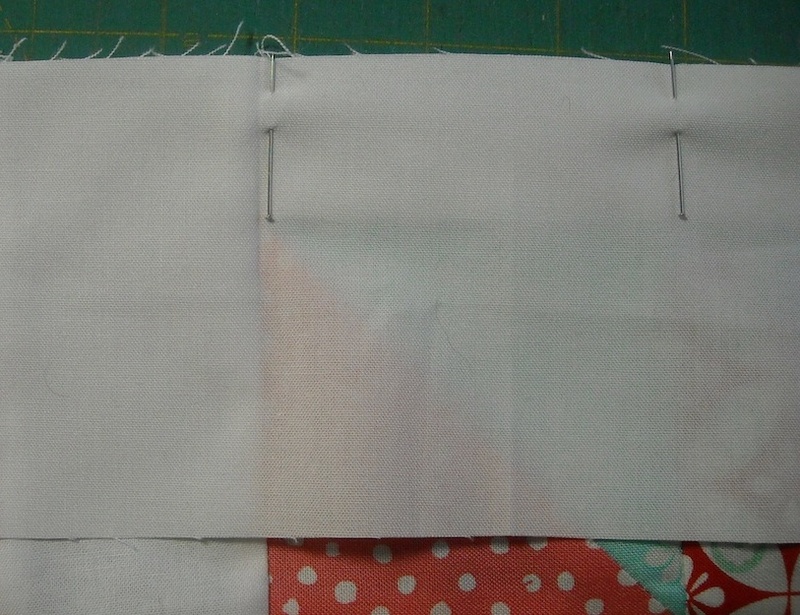 If it’s not long enough, sew one more strip onto the end to make it longer, then cut your border strip. You will need two border strips this length, so you’ll need to repeat this to get a second strip. Locate the center point of each of these strips and mark it with a pin or by finger pressing a little crease at the midpoint of the strip. We’re going to sew these two long strips to the sides of the quilt top. Now you’re ready to add the top and bottom borders. 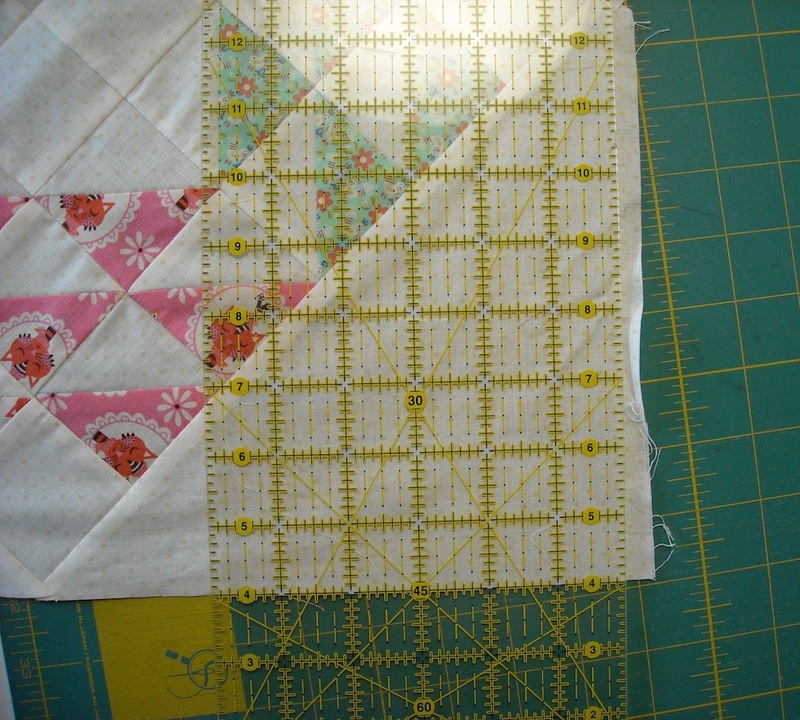 Measure your quilt from side to side through the middle, being careful not to stretch. Mine measured 74 1/2″. Sew two of the border strips together, end to end, pressing the seam to one side. Then cut the length you need from this longer strip. Repeat this to get a second strip this length. Locate the center point of each of these strips and mark it with a pin or by finger pressing a little crease at the midpoint of the strip. Again matching up the center points of the quilt top and the strip, pin a border strip to the top of the quilt, right sides together, and sew it on. Backstitch at the beginning and end of this seam, since it’s along the outer edge of the quilt. Press the seam toward the strip. Next week is the wrap-up! I’ve moved it to Wednesday, too, since I moved this post back a couple days. I hope to talk about how I quilted my quilt, provide information on binding, answer any questions you may have, and host a give-away to celebrate being finished! So if you have any questions, let me know. Meanwhile, happy stitching!